J.H. Dean (2004) Int. J. Toxicol., 23: 83-90. R.V. House, M.J. Selgrade (2010) Toxicol. Sci., 118: 1-3. J.G.Vos (1977) CRC Crit. Rev. Toxicol., 5: 67-101. D.L. Archer (1978) J. Food Prot., 41: 983-988. J.A. Moore (1979) Drug Chem. Toxicol., 2: 1-4. 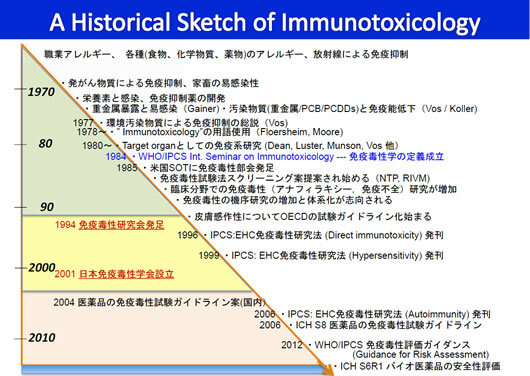 荒川泰昭（2012）ImmunoTox Letter, 17 (1): 1-5. M. Ohsawa, M. Kimura (1979) Biochem. Biophys. Res. Commun., 91: 569-574. A. Berlin, J. Dean, M.H. Draper, E.M.B. Smith, F.
Spreafico (Eds.) (1987) Immunotoxicology, Martinus Nijhoff Pubs., Dordrecht, p.XXIV. Raven Press, New York, p.1-511. 名倉　宏（1986）JSIT Newsletter, No.1: 1-2. 名倉　宏（2000）ImmunoTox Letter, 5 (2): 3.
for chemicals, WHO, Geneva, p.1-333. F.J. Quintana et al. (2008) Nature, 453: 65-71. C. Esser, A. Rannug, B. Stockinger (2009) Cell, 30: 447-454. N.B. Marshall, N.I. Kerkvliet (2010) Ann. N.Y. Acad. Sci., 1183: 25-37. V.J. Schulz et al. (2011) Toxicol. Sci., 123: 491-500. 澤田純一（2011）ImmunoTox Letter, 16 (1): 3-7. ILSI/HESI (2013) Clin. Exper. Allergy, under submission. R.R. Dietert (2009) Chem. Res. Toxicol., 22: 17-23. M.P. Holsapple, R. O'Lone (2012) Toxicol. Pathol., 40: 248-254. K. Hochstenbach et al. (2012) Toxicol. Sci., 129: 315-324. M. Collinge et al. (2012) J. Immunotoxicol., 9: 210-230. (2013) Toxicol. Lett., 203: 97-105.